On May 18, 1970 John S. Bock requested a zoning change for 7.34 acres of his land for the purpose of creating a landfill in Gypsum Canyon. One month later, after the zoning change was approved by the Board of County Commissioners, he requested Board of Adjustment approval for the landfill and received approval with the condition that his petition was to be granted on a year-to-year renewal basis. At the time, news reports indicated Mr. Bock’s intention to fill the canyon to create a site for a golf course. The Gypsum Canyon landfill was originally operated by C&L Sanitation Company and then by Nick and Tom Pinello who operated the business under several business names including Pinello Construction, Nick Pinello & Sons, and Solid Waste Management, Inc. Colorado Department of Health inspection reports indicate that the landfill was generally a well-run operation. However, during its first few years of operation there were complaints about blowing trash as well as “several” fires which were all contained within the landfill site. By 1980, the Pinello operation had undertaken daily policing of 26th. Street and Lower Gold Camp Road to pick up trash, and had enlisted the aid of church and Boy Scout groups to collect trash which had blown outside the landfill area. In January 1973, Mr. Bock requested a zoning change for 56 additional acres and an 8 acre increase in the size of the landfill. Then in September 1973, he requested a zoning change and landfill approval for an additional 2.55 acres. All of these requests were approved by the Board of County Commissioners. The 1973 expansions brought the approved size for the landfill to 17.89 acres and the area rezoned to 65.89 acres. 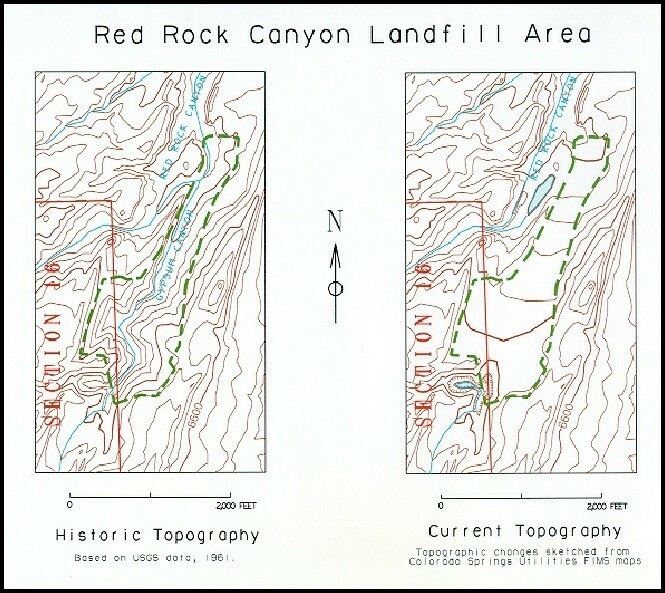 In January 1981 the Board of County Commissioners gave conditional approval to John S. Bock and Solid Waste Management, Inc. for a 25 acre increase in the size of the landfill, which extended the landfill site north to the confluence of Gypsum Canyon with Red Rock Canyon. The request for this 25 acre expansion was subject to extensive review and engineering study. Approval was for five years of operation and was later extended for one additional year. In August 1986 the landfill stopped accepting waste, and a final closure plan was approved by the Colorado Department of Health on October 7, 1987. The closure plan called for monitoring of the landfill for methane and monitoring for water contamination for a period of four years. Water monitoring was at wells down canyon from the landfill and in the Bock lakes. The landfill site had become the most extensive remnant of human activity in the Red Rock Canyon area, dwarfing the stone quarries of a century ago. The accompanying Figures show the original topography of the landfill site and the topography after the closure of the landfill. 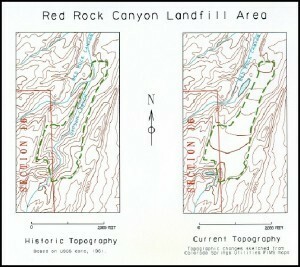 The original pre-landfill topography is 1961 topographic information from the USGS Manitou Springs 7.5 minute Quadrangle. Post-closure topography of the landfill site was sketched from Colorado Springs Utilities maps. It is noteworthy that the western portion of the landfill encroaches on approximately 8 acres of Section 16. If this “natural drainage pit” was completely filled with water, it would become a 20 acre lake in Section 16 containing over 600 acre feet of water. Since the drainage basin is only about 200 acres, this would require 35 inches of runoff which could be obtained only from a deluge of nearly Biblical proportions. In the extremely wet spring of 1999, the water level behind the landfill was close to 30 feet, at which point the landfill had impounded somewhat less that 25 acre feet of water in lake of nearly 2 acres.